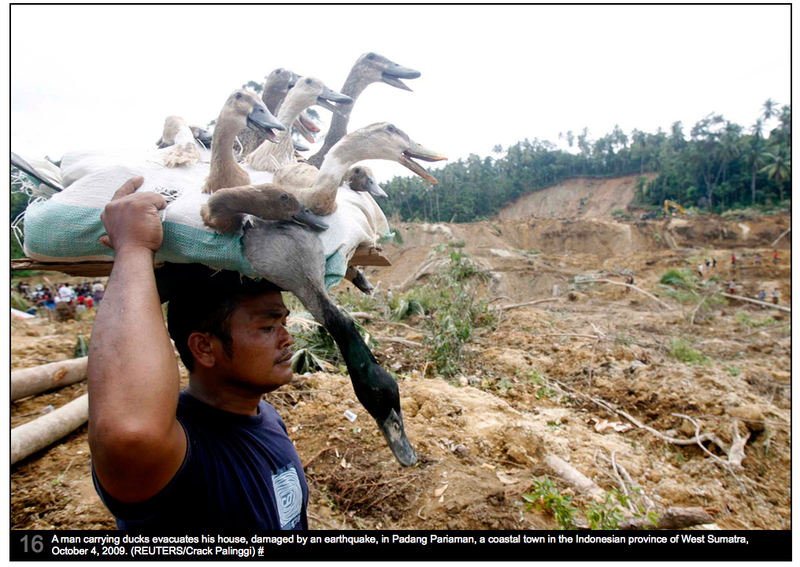 The Boston Globe did a photojournal of the 2009 Sumatra earthquake. I've been holding on to this image for a while, and debating whether or not to post it. The picture below usually would make me laugh (since ducks are hilarious), if it wasn't so sad (salvaging what he can from the destruction). Events like these in Sumatra, and most recently in Haiti, remind us of the power of nature, as well as the good fortune so many of us enjoy. If you haven't already, please consider making a donation to the Red Cross. You can text "HAITI" to 90999 and make a $10 donation to support the American Red Cross Haiti relief efforts. The donation will be debited from your cell phone bill. A 48-hour-old fundraising campaign to help Haiti earthquake victims, done solely through text messages, was already stunning Red Cross officials on Thursday when it hit $3 million. By Friday morning, the tally had more than doubled. Update 5:20pm: I have been alerted to the fact that these mobile donations can take up to 90 days to reach the Red Cross (CNN, Gigaom). Jonathan Aiken, spokesman for the Red Cross, says "The Red Cross already has cash on hand, so it's putting that money to work now and will replenish its coffers once the mobile donations are officially processed... That's how it's always worked," Aiken said. "So in a way it doesn't matter which exact date the money officially comes in. And in any case, we're still going to be in Haiti 90 days from now -- this is not going away anytime soon." The Better Business Bureau recommends that consumers give to charity online, by phone or mail if they want the funds deposited immediately.